Replacing your front entry door can have a big impact on the curb appeal of your home as well as the style of your home’s entry or foyer. There are many entry door styles to choose from, and each will bring a different style and unique look to your home. The configuration of your entry is a good place to start. The configuration of your door refers to the door design you select for your home: single front door, double front door, and any added elements like decorative sidelights or transoms. Here are some popular front door configurations and options to consider. Front door designs with glass in the door, sidelights, or a transom can impact your home’s style and ambiance. Doors with glass bring light into the home and add aesthetic appeal to the design. Front door designs can have decorative glass, clear glass, or glass with blinds enclosed within them. When choosing a door with glass, consider the amount of light you’d like to let in as well as the amount of privacy you are seeking. Glass entry doors are typically available in ¼ light, ½ light, and full light; each style allows a different level of sunlight into the home and has a different impact on style. Make a beautiful statement by adding decorative glass to your front door. There are many choices available including leaded glass crystals, stained glass, and beveled glass. Decorative glass patterns can help add privacy while also letting in light. Pella’s decorative glass options include unique glass types and distinctive caming. Grilles and between-the-glass options vary depending on the type of door and the manufacturer. These options are another way to customize the look of your door and can be adhered to the outside or placed inside the glass to reduce maintenance and the chances of getting chipped. Grilles can be painted or stained and are largely an aesthetic option. Consider different grille patterns to achieve the look you’re aiming or - whether it’s traditional, craftsman, or something more modern. Sidelights are narrow windows placed beside an entry door to expand your view and add light. A transom is a window that sits above your door to add architectural detail and style. Choose the configuration that is right for your home: you can have an arched or rectangular transom, and sidelights on one or both sides of your door. Browse sidelight and transom options available from Pella. Double entry doors are a great choice if you want to make a big statement and offer a grand entrance for your family and friends. On a practical level, double entry doors can create a wider opening to accommodate bulky furniture. Double doors with a transom can make an even bigger impact. You can get double front doors in wood, fiberglass, or steel and with or without glass. Whatever you choose, it's a dramatic look that will add value to your home. There are multiple material options available to you when selecting a front door. Fiberglass is a versatile option as it can be made to look like wood or other materials, and is incredibly durable. Wood offers natural beauty, which is both traditional and elegant. Although wooden front doors may typically require more upkeep, mahogany or walnut entry doors can provide a stunning appearance that isn't available with other materials. Finally, there is steel. Typically less expensive than wood or fiberglass, it's an economical and highly customizable option for your home. However, steel can be more easily dented or scratched than fiberglass or wood and can also be a temperature-sensitive material making it warmer or cooler to the touch depending on the air temperature. Your hardware and locks make a visual statement and can add security. Once you’ve decided on your door configuration, you’ll need to look at hardware options. Be sure to do your research on hardware and consider not only visual aesthetic but also how the door locks and the difficulty of re-keying. New technology can offer added security. There are many front entry door styles, configurations, and materials to consider when choosing your replacement front door. Your personal style and preferences will impact your decision. Knowing your front door options for materials and glass can help you get started towards having the front entry of your dreams. 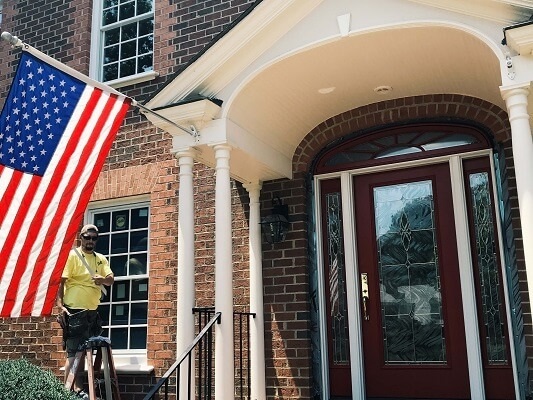 If you are looking for inspiration to help you decide the perfect door design for your home, check out these projects featuring some stunning front door styles. This double entry door replacement features wood French in-swing Oak Grain fiberglass doors stained with Red Mahogany. The divided light glass lets plenty of light into the home. 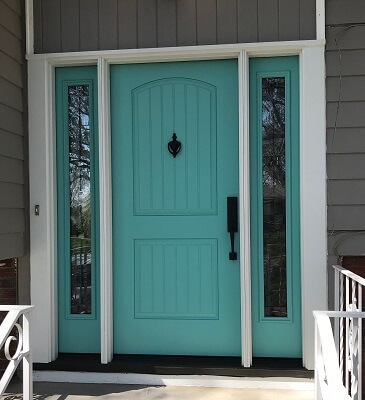 This bright and cheery single entry door is a Fiberglass solid door with decorative sidelights and an transom. In this project, the homeowner changed the configuration of their entry by replacing a dated side-by-side entry door with a single fiberglass door with two matching sidelights.